Makeup by Keri Ann: Makeup by Keri Ann is Celebrating 5 Years of Beauty! 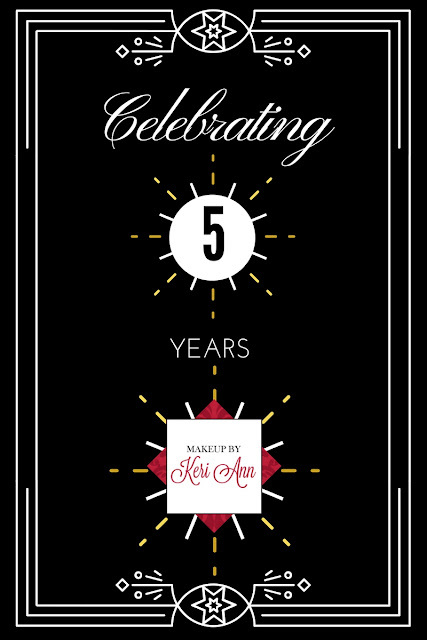 Makeup by Keri Ann is Celebrating 5 Years of Beauty! Five years ago I took a huge leap of faith and launched this website and business, Makeup by Keri Ann. Even though I had retailed makeup for over fifteen years, I was not confident that I was ready to be a freelance makeup artist. I was not convinced I had enough training. I wasn't sure I could be successful building my own brand. I didn't know how I was going to make a name for myself in the fourth largest city in the United States. I felt strongly that The Lord was guiding me in this direction. Every person in my path seemed to mention freelance makeup artistry to me. Even though I had a huge list of every doubt and fear, the Biblical story of Moses kept coming back to me. Moses felt insecure in his abilities to lead the Hebrew people out of Egypt, but God continued to call Moses to the task. The phrase "God does not call the equipped, He equips the called" resonated with me. So, I purchased a domain, created a logo and wrote my very first blog post. I will never forget my very first photo shoot. We spent 10-12 hours putting 2 young models in 3 different hair and makeup looks. The photographer I was working with really wanted to get creative, out-of-the-box, looks by the end of the day. I was so nervous half-way through the shoot, I desperately wanted to walk away, but I faced my fears head-on and kept working. I felt like I was too slow, too unprepared, and not talented enough, but the photos proved otherwise. The models' makeups were beautiful and I was shocked that I was the artist who created those looks! The negative doubt and self-talk still played in between my ears while I was working on my first few clients and weddings. Half-way through an appointment, I would feel the same nervousness and desire to walk away I had felt at my first photo shoot. I've since learned that many of my insecurities also plague many other creative people. Perfectionism tends to be a trait many artists battle too and I am my own worst critique. However, I've also learned that I am so successful with my clients because I take plenty of time to get to understand what they want and need - good listening skills are a must when you a corporate chaplain (my former career). While I've never worked backstage at NYC's Fashion Week or prepared a celebrity for the big screen [yet], I create makeup looks that women are comfortable wearing. Thank you so much for celebrating this milestone with me! Here's to 5 more years of beautiful!